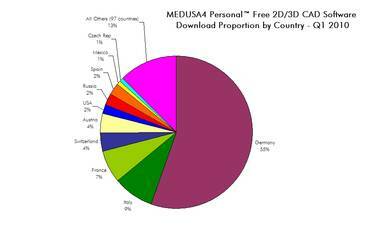 CAD Schroer’s MEDUSA4 Personal™ CAD package, now also for business use, is deployed in 152 countries. About a third of all users are on Linux. Cambridge, UK and Pittsford, NY– 26 May 2010: In Q1 of 2010, downloads of MEDUSA4 Personal (the free version of CAD Schroer’s professional 2D/3D drafting suite, used by companies worldwide) rose by 38% in comparison to the same period last year, the engineering solutions provider said today. CAD Schroer attributes the growth partly to its commitment to regular software updates; partly to the popularity of Linux; and partly to the creativity of small businesses during tough economic times. Its eSERVICES portal allows registered companies to deploy MEDUSA4 Personal free of charge at the office, then convert commercially viable results from Euro 2.99. “The software and its modules meet all the needs for hobby and even small business design requirements,” said an e-mail from Russia, where 68% use Linux, compared with 33% globally. “A very good alternative to a***cad,” said a recent post by a Honduran member of the Warianoz Linux forum, who uses MEDUSA4 Personal to design model airplanes. Latin America has the biggest proportion of users on Linux. In Q1 of 2010, 100% of Honduran, 93% of Mexican and 88% of Argentinean downloads of the 2D/3D CAD software were for Linux. The top ten MEDUSA4 Personal user countries and their approximate proportion of Linux users in Q1 2010 were: Germany (10%), Italy (65%), France (31%), Switzerland (13%), Austria (14%), USA (42%), Russia (68%), Spain (87%), Mexico (93%) and the Czech Republic (73%).